May | 2008 | Two cultures, one mind. It looks a nice day out there, well it was at 7am when my neighbours decided to have a skip delivered, then spend 20 minutes scraping it across the tarmac, all this happening outside my bedroom window. It does mean I’ve started marking a little earlier than I intended to. The assignment is all about last.fm, as mentioned before, and it seemed only appropriate that I download and run the application whilst I mark the assignments. Simply put the name of an artist in, and it will find music by that artist and similar, and stream it to you. It works with Growl, so you have a little pop-up of the track, and you can show that you ‘like’ or ‘hate’ a particular kind of music, and it will adjust it’s preferences based on this. There’s a whole load of social networking stuff behind it, but at the moment it’s just delivering nice, ad-free music which I like to my mac with no hassles. But of course all this, plus this blog posting is simply a displacement activity. Back to marking. After a piece of toast maybe. I received a strange email earlier this week, which I simply thought was a piece of spam which had simply missed the usual excellent spam filters. However I received the following email this morning from Elonex – please note my emphasis. You may have received an email earlier this week that simply said sdfsdf. This was an internal test email that was sent to a number of customers in error. You will receive an update email in the next two weeks with details on delivery dates. If you have cancelled or have an incomplete order you would also have received this mail but your order will remain cancelled and unaffected. So Elonex may still hit their June delivery date, though to be honest my confidence is not high. It’s a real shame that Elonex hasn’t been able to capitalize on the buzz that surrounding the announcement of the One. Let’s hope that this delay is not indicative of a more serious problem. I know there are other blogs posting about Elonex One, I’ve opened the ‘comments’ section below, it would be great if other people who are blogging about this post a link to their own blogs. I mentioned that around a month ago my Sat Nav was stolen from my car. I did buy a replacement straight afterwards, but was really unhappy with it. It offered no options to avoid motorways, I couldn’t change the voice, and some of the directions didn’t seem accurate to me. So as soon as I could justify it, I was hunting for another TomTom system. My old ‘One’ was over two years old, and was version 1 of the system. It was tempting to wait until the new version comes out (but this will be more expensive at launch, and I’m not persuaded that the price difference is worth it), but there are some really good offers on the version 3 at the moment. After some hunting, I decided that the best offer for me was here from Amazon. The ‘Explore’ pack comes with safety cameras pre-loaded, and a carry case which always helps. And at £105, it’s half the price (and size) of my first TomTom one. I’ve been really impressed, as I thought I would be. TomTom has evolved over time, and extra features have added to it’s usabillity, not taken away from it. For example a gentle ‘bong’ when you significantly exceeed the speed limit. The maps are clear, and I find the directions at islands very clear, telling you take the 1st/2nd/3rd exit, rather than ‘turn left/right at the roundabout’. And there’s also improved security, as you can add a PIN number to unlock the sat nav. Doesn’t really help once someone’s broken in, but maybe knowing that the device is useless would help my peace of mind. 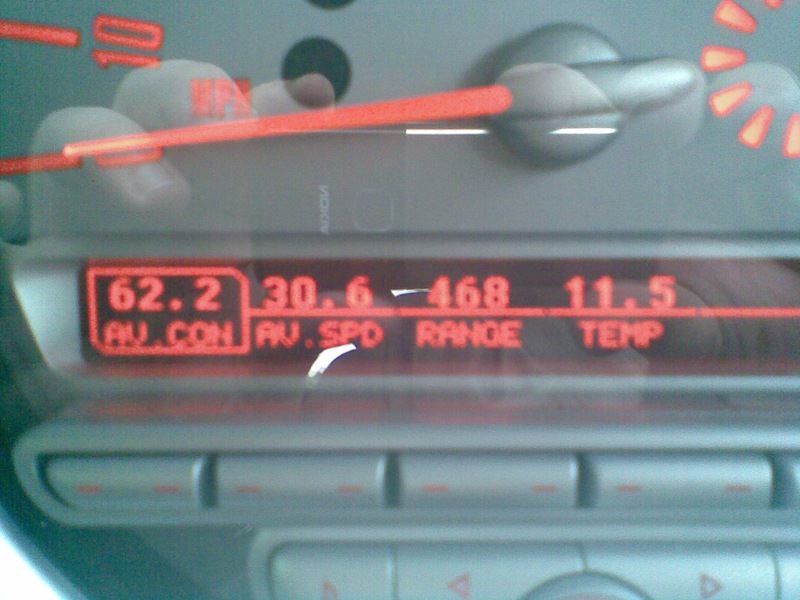 The picture below taken by my camera phone shows the fuel consumption (in mpg), average speed, and range (in miles) for my journey into work. OK, the pic was taken on the forecourt of the MINI dealership as it’s in for repairs, but that’s a minor point! A stinking headache from yesterday afternoon to the not-too-early hours of this morning meant that I’ve had to be careful what I’ve done today, when a vigorous shake of the head can cause nausea and force me to stick ice cubes to my head. I was planning on working from home, and have done some PC work, but have spent more time reading MSc dissertations and having a ‘view’, even if I’ve not completed the marking sheets. But there’s no rest for the wicked, and there’s been a flurry of emails and phone calls this evening from my Open University students, asking for extensions for the e-business course T320. This was predictable – the course in this presentation is very intense, being delivered over six months rather than the more usual nine month period. This means the first assignment is due just a month after the start of the course. Compare this to the other course I tutor, which starts in February, and the first assignment is not due until the end of April, nearly three months after the start. I’m pretty well set up for the marking at the weekend though, this first assignment is a 1,500 word business report, and should be relatively easy to mark, though it’s important, as always to get the first feedback to students in a way that’s supportive and accessible. The students have to evaluate the e-business last.fm, against the following questions. What is this organisation’s relationship with technology? What are the key relationships for this organisation? How does this organisation add value for those individuals and organisations with which it has a relationship? How is e-business used to generate revenue as part of this company’s business model? Has this organisation seen e-business technologies as an opportunity or challenge? Tomorrow however I’m back teaching, as well as dropping my poorly MINI into the garage, and preparing for two days of placement visits around the country to finish off the week. Who needs an Apple TV? Before the main part of this posting, another of my ‘I like the Internet’ style postings. For the last couple of weeks I’ve been obsessing slightly about a tv series I watched about five years ago. I could remember nothing about this series apart from the subject (about how various technologies have turned against the original dreams of the scientists), and a few words from the opening credits. So Googling ‘I dreamed last night, moon so bright, prince charming stepped into my room’, I came up with the original 1950’s promotional film which was edited into the opening credits thanks to www.archive.org. The original film was called ‘Design for Dreaming’. Putting the title into Wikipedia pointed me to the article pointed me to the article for the documentary I was looking for – Pandora’s Box. A search on Amazon confirmed that it had not been released on DVD. But a search on YouTube found that someone had kindly uploaded all five episodes – here’s the first one about Soviet planning and their perception of technology. I wanted to watch these YouTube videos on my television. I don’t have Apple TV, or a Wii (yet), what were my options? I remembered that my new television had a PC-out signal. It was a work of moments to connect my MacBook to my tv, select the correct output, and through my wireless mighty mouse control my laptop from the other side of the room. But as anyone who reads this blog knows, I suffer from a painfully slow broadband speed, and the stuttering made this a difficult solution – YouTube streaming usually works OK, but I didn’t want to be watching the programmes with half an eye on the buffer at the bottom of the screen. This is where a nifty tool from RealPlayer comes in. RealPlayer 11 for Mac OS X comes with a tool called RealPlayer downloader. When running, this caches all video, and provides the option for you to save these downloads as flash video (.flv format). It was the work of moments (well, an overnight process) for me to kick off ‘viewing’ the YouTube videos, save them as .flv through RealPlayer downloader to peruse at leisure. Even better, by using VLC media player not only is the playback of better quality than RealPlayer, but I can save the files as .mp4, and view them on FrontRow, or on my iPod. The only problem with my limited experimentation so far is that I can’t transfer sound, but isn’t this the sort of problem that Bank Holiday afternoons were designed for? This isn’t HD tv quality – far from it, but for a documentary using archive footage, or for animation this seems to be a very acceptable solution. As it is, I’m watching the episodes (and they are as excellent as I remembered them) on my MacBook whilst using Big Mac for work, rather than on my tv – I’m not in a ‘sitting in the lounge’ mood. I am tempted though to consider this addition to my lounge, or will have a good look when it’s released. For the first time in years I am traveling a long distance by train without my laptop. Have I missed it? I’ve not been bored, the people around me, both on the way there and back have kept me amused, and I’ve spent much more time keeping in touch with my friends texting. But whilst I’ve been making notes in my Moleskine, including this blog post, I’ve been a little frustrated that I’ve not been able to do more. But it has given me chance to read up on Scrum, see yesterday’s post, and I guess have generally enjoyed the time free from electronic distraction. This is the sort of trip which I’m hoping my Elonex One will be useful for. Lighter than my MacBook, and with a smaller screen size it should be more train-friendly – it’s not the horizontal length which is a problem in a constricted space, but the vertical depth of screen and keyboard which causes issues, especially with regard to the so-called ‘airline’ seating configuration. I have texted a few people on this journey bragging that I have found the perfect standard class seat on a Pendolino, and I will now share it with the rest of the world. I don’t expect too much praise for this information, though if anyone wants to create a Nobel Peace Prize for services to passenger transport, I will allow my name to be put forward. Head to Coach A on a Virgin Pendolino – the very back of the train (heading to London) or front (if heading out of Euston). This is usually the quietest coach anyhow (and is labeled as the Quiet coach, though this isn’t always respected). The other advantage of this coach is that it has a non-automatic toilet, so appears to avoid the well known Virgin Toilet Smell well known to many travellers is rarely experienced. Anyhow, half way down the carriage A there is a luggage rack, and a row of two seats with a small table for two – the sweet spot on Virgin trains. The big advantage too is, luggage permitting, you can have a huge amount of legroom. So in summary, Coach A, Seats 027 and 028 – unless you’re sharing a coach with me! Just a warning, as Coach A is a ‘quiet’ coach you are supposed to be considerate of other users. Whilst iPods appeear to be ‘OK’, loud telephone conversations will yield an admonishing glare. For me, the only downside of the large amount of train travel I’ve been doing over the last few weeks is that much of my creative writing, and the short story ideas seem to be train-focused. Maybe I should just read Murder on the Orient Express and get it out of my system. For the last two years I’ve been the sole tutor on a module on the MSc IT Project Management with International Business. The module is called ‘Advanced Project Management’ – BAPM to it’s friends (of which there are very few). The module tries to provide depth and breadth to students in Project Management techniques, whilst recognizing that this is a Masters level course, so it’s important to allow students the chance to stretch whatever intellectual muscles that they feel comfortable with, both inside the classroom and outside. This is where I am fortunate when teaching Project Management – there’s lots of exercises and scenarios which can be used, and each week new case studies present themselves. PRINCE2. (Projects IN Controlled Environments – 2). This is my ‘bread and butter’ project management technique, used within the UK, most of Africa, Australia and also very big in India and surprisingly, France and Holland. This is clearly the subject I feel most comfortable about, and can discuss with little difficulty the pros and cons of the technique. This is of course the technique which I am certified in (and will be until 2012, having recently renewed my Practitioner certification). PMBOK. (Project Managers Body of Knowledge, also known by the name of the certifying body of Project Management Institute). This is huge in America, generally when people talk about certified project managemers, this is usually the technique which they are talking about. EU-PCM. (EU Project Cycle Management). I was first exposed to this technique when preparing a JISC bid for the university. It’s a good technique, and has some good international elements, but because it is not IT-specific, and is usually focused on large scale projects (measured in millions of Euros), students struggle with some of the concepts, and it’s frequently been used just to provide a ‘third place’ position marker compared to the other methods. I reflected on this long and hard after the last presentation of BAPM. The simple answer would have been to carry on teaching the same old – but it’s clear that I’m doing students a disservice, encouraging them to learn about a technique which is clearly of very limited use. Therefore, I have decided to ‘ditch’ EU-PCM, and instead develop my own (and my students) skills in Scrum. The library has purchased some Scrum books, and they’re on my desk now, and will be in my rucksack heading down to London tomorrow. 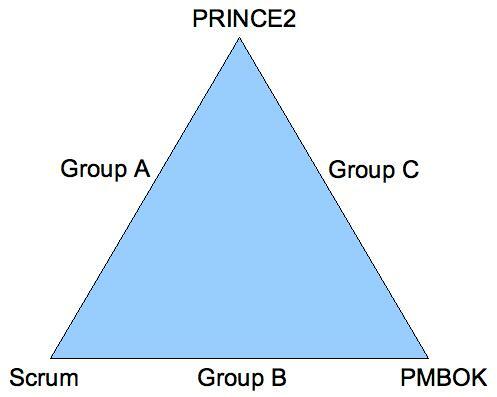 So group A will compare PRINCE2 and Scrum, Group B will compare Scrum and PMBOK etc. So my job for the next few days when I’ve had enough marking will be to start to prepare a schedule for ‘new-BAPM’, and ensure that I can provide a good, coherent experience for students on the module. My internet has been fading for a while, but like toothache I’ve been putting off doing anything about it. But after switching my router off this morning to ‘rest’ it, when I got back home today my connection was dead. It’s no joke having an unexpected outage of internet connection – I had forms to download, and addresses for where I was going tomorrow. My friend texted me TalkTalk’s technical support number, and after about fifteen minutes onto them, I got connected. I’m not convinced that they actually *did* anything, the person I was talking to was not speaking too clearly. Still, I’m up and running, and at a faster speed than I’ve had for a while. This got me a little disgruntled however, and I’ve spent another 10 minutes on the phone to Sky, to see what their options are for me. Unfortunately, even on their ‘Max’ service, they can’t guarantee that I would get an improved service from that which I’ve struggled with with BT, Freeserve, and for the last couple of years, TalkTalk. According to their postcode search, they can only guarantee 256kbps, whereas at the moment I get 500-600kbps, not exactly speedy but (usually) (fairly) stable(ish!). Sky have suggested that I talk to BT, and see if there’s a chance that my phone number could be connected to another exchange – the £200 one off cost for this could be worth it if I can get a significantly quicker broadband connection. But for the short term they have pulled the piece of string that connects me to the Internet has been tightened, and seems to be working OK. Anyone else getting a bit concerned about the despatch of the Elonex One? I emailed Elonex over the weekend, concerned that the web site did not appear to have been updated since the product launch, and querying when, exactly in June the product would be delivered. I received the following reply. We do not have an exact date at the moment but delivery is still scheduled for June. As soon as we have a firm date we will be in touch. Maybe it’s not *very* reassuring, but I’m guessing that a speedy response to the email is a good sign. I’ll keep an eye on this, as I know of at least two other people who have One’s ordered, and it will be interesting to see what happens come despatch time. In other news, postings here have been a little sparse as ‘today I have been marking’ blog entries aren’t the most interesting. I’m only physically in university two days this week, as placement visits are taking up much of my time. Normal service, as they say, will be resumed as soon as possible.